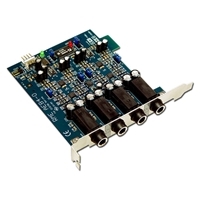 The AEB4-I (Analog Expansion Board) adds 4 analog inputs in professional quality to all ADAT capable RME cards. Level adjustment +4 dBu/-10 dBV, 107 dBA SNR and a servo balanced input circuit deliver perfect sound and sonic clarity. The AEB4-I is designed for maximum flexibility. Both stereo inputs 1/2 3/4 are automatically copied to channels 5/6 and 7/8. Installation is done in a convenient manner using the supplied bracket, or - as no contact to any slot on the motherboard is needed - at any place inside the computer. Nuts for all TRS jacks and a drilling template are included. The AEB8-I offers 8 inputs with 4 stereo TRS jacks. Usual insert cable can be used to split the connectors from stereo jack to mono jacks. Level adjustment +4 dBu/-10 dBV, 107 dBA SNR and highest suppression of PC-noise guarantee perfect sound quality. Using the Analog Expansion Board is very easy to do, thanks to the clearly structured and informative Settings dialog of the RME cards. The AEB4/8-I operates like any other converter with ADAT output, but is connected internally.